Enjoy beautiful photography on the big screen, with info and commentary from popular wildlife photographer Leah Serna. Whether you’re a photographer wondering where to get that next amazing shot or you want to compare equipment details with other shutterbugs…. 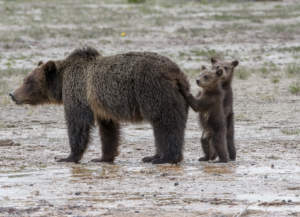 or you just love hearing about and seeing nature at its best, this workshop will become your favorite m emory of the 2019 Skagit Eagle Festival. 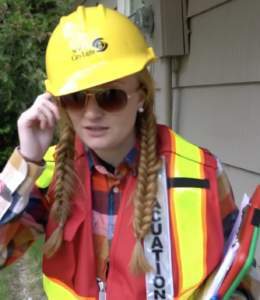 Leah was born and raised in the Cascade Foothills. She says that although she grew up hiking, fishing and riding a horse, she never thought she’d be crouched in a field waiting for a short-eared owl to fly by, sitting on the river all day with the eagles, or traveling around the country to find bears and moose. Concessions available for purchase, including the best popcorn in Skagit Valley, with real butter and free toppings. Coffee, tea, water, candy and soda also available. Sponsored by the SKAGIT EAGLE FESTIVAL and funded in part by a grant from Skagit County. Questions? Contact theatre owner Valerie Stafford, (360) 466-8754 or Valerie@Concrete-Theatre.com. The January 2019 meeting of the Concrete Chamber of Commerce is Thursday, January 17 at 11:30 a.m. at Annie’s Pizza Station. Lunch is on your own – choose from a very tasty menu of pizza, soup, paninis and other favorites. We’re excited about an upcoming event, part of this year’s Skagit Eagle Festival, called This Beautiful Country. 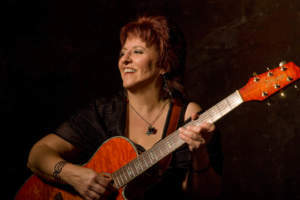 It’s a special mulitmedia presentation featuring the music of Marcia Kester against a backdrop of local scenery on the movie screen at the historic Concrete Theatre in Town Center. You’ll find lots of audiovisual beauty here! The event is FREE. Doors open at 1:30 p.m. Concessions will be available for purchase, including the best popcorn in Skagit Valley (honest! ), with real butter and free toppings. Coffee, tea, water, candy and soda are also available. This event is sponsored by the SKAGIT EAGLE FESTIVAL and funded in part by a grant from Skagit County. Who knew there we so many ghastly characters in Concrete’s past? Over these last 13 years, we’ve learned all about some of our most unusual residents, including Fred Cole, the lawman with a very sketchy past, Mrs. Henry Thompson, who refuses to accept the fact that her husband is gone (never mind the fact that she, too, is dead), and assorted “Ladies of the Night” who continue to party in our buildings late at night. If you like creepy tales based on actual facts, if you’re looking for a fun (but slightly twisted) way to spend an October evening, join us on Saturday the 6th, 13th, 20th or 27th. The Concrete Ghost Walk regularly sells out — and we’re limited in the number of bodies (  live ones, that is) we can squeeze into our haunted sites and alleys. We hate turning people away. TICKETS ARE ON SALE NOW, so please get yours so you won’t be left out in the cold, dark, scary night, all alone , wondering what went wrong…. And what’s that noise over there in the shadows?? Trust us, you don’t want to be that person. ♥️A chance to get some outdoor exercise while you take in the natural beauty of our community and get ready for the Cascade Days Parade! You have 75 minutes to walk or run to each of the stations to pick up a playing card. You walk the route, collecting a poker hand of 5 cards. 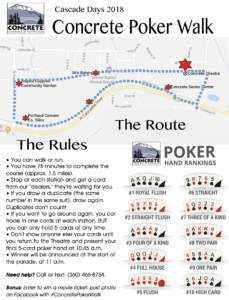 To be eligible to win a PRIZE, you must return your poker hand to the Concrete Theatre at 10:45 a.m., right before the parade begins on Main Street. ♠️♣️♥️♦️ NOTE: The Concrete Poker Walk is FREE! It’s a way to join with friends and family and celebrate our health and fitness, while competing with one another for the best poker hand in an easy, friendly manner. WHO’S BEHIND THIS POKER WALK? ♠️♥️ The event is sponsored by the Concrete Chamber of Commerce, Concrete Theatre, and Encore Fitness. PRIZES are donated from local businesses. You don’t need to print anything, your name will be on our registration list. Questions? Please contact Valerie Stafford, Chamber President, at (360) 466-8754, or via email: Valerie@Concrete-Theatre.com. A sold-out crowd at The Concrete Theatre in Concrete on July 20 will watch the premiere showing of “Escape from Diablo,” a safety video designed to help people understand evacuation procedures at Seattle City Light’s Skagit Hydroelectric Project and its company towns of Newhalem and Diablo. The 12-minute video uses humor to engage viewers in a serious safety message that is already catching on. Strong community response to a trailer for the video led to the development of a Baker Street Safety Block Party that will take place around the premiere. And community members who started a viral video challenge to spread the safety message using “Escape from Diablo’s” signature tilt of the sunglasses and “safely” catch phrase. The block party will include safety exhibits, family activities, emergency responders, demonstrations and emergency vehicles. The event is sponsored by City Light, the Concrete Theatre , the Concrete Chamber of Commerce, and the Town of Concrete, with support from Puget Sound Energy, the Upper Skagit Library District, Annie’s Pizza Station, Cascade Burgers, Cascade Supply, Concrete Herald, 5b’s Bakery, Double O Ranch, Heritage Inn, Skagit River Bald Eagle Interpretive Center, and Glacier Peak Resort. Exhibitors include the Skagit County Department of Emergency Management, Washington Department of Natural Resources, Aero Skagit Emergency Services, Darrington Fire District 24, Skagit County Fire District 10, East County Water Rescue, Skagit County Fire District 14, the Whatcom County Sheriff’s Office and the Lions Club, and others. In August 2015, the Goodell Creek Fire burned about 7,100 acres of forest, damaged transmission lines at the Skagit Hydroelectric Project and threatened the Diablo Powerhouse. City Light evacuated Diablo, voluntary evacuations were announced for Newhalem and the utility assisted with evacuations at the North Cascades Institute’s Environmental Learning Center. Admission to the event and the video showings is free. 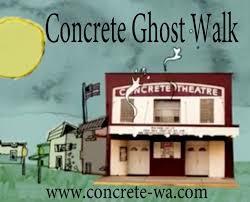 The theater is located at 45920 Main St., Concrete, WA 98237. The block party begins at 5 p.m. across the street from the theater. The first showing of the video begins at 6 p.m. followed by a safety discussion. Seats are available for the second showing, which starts at 8 p.m.
Reporters and photographers are invited to cover either showing. On Sunday, June 3 at 12:00 a.m., the second annual Mt. Baker Ultra Marathon will take off. It’s a 55 mile out and back foot race from our Town Center to Mount Baker’s Sherman peak at 10,160ft (3,097m). The race draws its inspiration from the century-old Mount Baker Marathon that lasted for three years from 1911-1913. 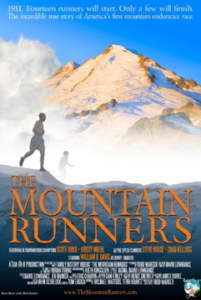 You can watch a film about that historical race at the Concrete Theatre on Saturday, June 2 at 7:30 p.m. See more. After the film the 2018 runners will meet in the theatre and you can sit in on their pre-race meeting, led by Race Director Dan Probst. For more information about the events at the theatre, please contact Valerie Stafford, (360) 466-8754. In honor of Earth Day, the Concrete Saturday Market Association will host a Seed Swap & Sale at the Concrete Community Center on Saturday, April 21. 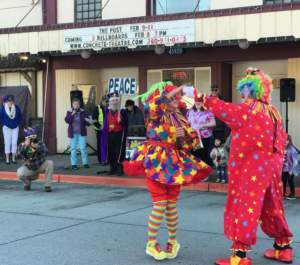 Erma Baude brings news and information from the people in the Upper Skagit Valley. Soul features Inspirational Music and information. Featuring the music of Smooth/Contemporary Jazz, old style big band like Frank, Ella, Sarah, Tony Bennett, Stan Kenton, Jonah Jones, Clark Terry, etc… and other jazz artists. Host Rodney takes you on a journey of rock n roll history through music. Self described Tarheel plays Old Time Country Favorites and Classics. Join the Bluegrass Belle as she shares the best of Bluegrass on the Friday Lunchbox. Edgefield shares her passion for Classical Music. Locally produced news and information show regarding the issues and people in Skagit County. Speak Up! Speak Out! is a half hour weekly radio show produced at Skagit Valley College committed to community, peace, justice, and non-violence issues. Democracy Now! is a national, daily, independent, award-winning news program hosted by journalists Amy Goodman and Juan Gonzalez. Pioneering the largest public media collaboration in the U.S.
Sprouts is a 29-minute weekly program featuring radio content being produced by grassroots community radio stations, Indy Media Centers, and other independent production groups. We celebrate these many vital and diverse voices by bringing them to a national audience. Sprouts is produced collaboratively by radio producers across the country; sometimes even the world. Host David Barsamian interviews humanitarian and progressive thinkers, such as Noam Chomsky, Bill Moyers, Amy Goodman, Howard Zinn and others. Strange Currency brings you new releases, old favorites and forgotten classics. We spotlight local and regional acts, including guests on Currency Exchange, our live in-the-studio program recorded at the KMUW studios. BackStory is a public radio program & podcast that brings historical perspective to the events happening around us today. On each show, renowned U.S. historians Ed Ayers, Peter Onuf, and Brian Balogh tear a topic from the headlines and plumb its historical depths. Moyers & Company, a weekly series of smart talk and new ideas aimed at helping viewers make sense of our tumultuous times through the insight of America’s strongest thinkers. The program also features Moyers’ hallmark essays on democracy. As Duke Ellington famously said, there are two kinds of music. Global Village plays the good kind…from all over the world, with a fresh, inventive musical mix, and welcoming presentation. Stuck in the Psychedelic Era features music fromroughly the years 1964-70. The show is rooted in the music generated by self-contained American bands of the late 1960s (and their British inspirations), yet is constantly expanding beyond those roots to create an eclectic blend of music unlike anything else in modern radio. Earth Eats is a weekly program delivering thefreshest news and recipes inspired by local food and sustainable agriculture. Each week host Annie Corrigan and Chef Daniel Orr present recipes you can make at home, interviews with farmers, and musings on food, history, and culture. The Mimi Geerges Show is an independently produced talk radio program and features the country’s leading experts, authors, scientists and entertainers. Our program presents a diversity of views on a wide array of topics. Art of the Song is an independently produced radio show with music and interviews exploring inspiration and creativity through songwriting and other art forms. Learn why songwriters and artists create, how they become inspired, and how you can tap into that creative source in every aspect of your life.